The spaceshuttle Atlantis rolled out toward its Florida launch pad early Wednesday to preparefor a November liftoff, even though NASA is still unsure of exactly when thespacecraft will fly. NASA istargeting a planned Nov. 12 launch from Pad 39A at the Kennedy Space Center inFlorida for Atlantis and a crew of six to deliver a vital load of supplies andspare parts to the International Space Station. It will be the agency?s fifthshuttle launch of the year ? the most since 2002. But NASAcurrently doesnot officially have a slot for Nov. 12 on the Eastern Range over the Atlantic Ocean, which thespace agency shares with the nearby Cape Canaveral Air Force Station forshuttle flights and unmanned rocket launches, an agency spokesperson said. The agency plans to make a formaldecision on when to launch Atlantis during an Oct. 29 readiness review. NASA has invited up to 100 of its followers on Twitter to watch the launch in person as part of the agency's tweetup campaign. Registration for the event opens on Friday via NASA's tweetup Web site. There aretwo unmanned rocket launches scheduled in November that NASA must work aroundin order to try to launch Atlantis next month. The agency is also watching theLeonids meteor shower, which is expected to peak Nov. 17, to be sure Atlantisdoesn?t launch at the shower?s height. NASA ishopeful that it can get at least three launch attempts for Atlantis inNovember, before standing down around Nov. 19 or 20 due to unfavorable sunangles atthe space station, which can cause heating and power concerns, agencyofficials said. ?We stillhave some negotiating to do,? NASA spokesperson Allard Beutel told SPACE.comfrom the spaceport. ?Whatever day it ends up being, we?re getting ourselves ina position to be ready to launch.? Wednesday?slaunch pad rollout is part of that plan. NASA beganhauling Atlantis toward Launch Pad 39A at 6:38 a.m. EDT (1038 GMT) using itsmassive crawler carrier vehicle originally built for the Apollo flights in thelate 1960s and 1970s. The 12 million-pound (5.4 million-kg) combo of theAtlantis and its carrier can move at a top speed of about 1 mph (1.6 kph). The tripbegan a bit late due to last minute glitches and took nearly seven hours totraverse the 3.4-mile (5.4-km) river rock-lined crawlerway to Pad 39A. On Monday,Atlantis? six astronauts ? commanded by veteran spaceflyer Charlie Hobaugh ? willarrive at the Kennedy Space Center to begin several days of final training thatwill end with a launch dress rehearsal and emergency escape drill, Beutel said.They spent today training in a shuttle simulator at NASA?s Johnson Space Centerin Houston. Hobaugh andhis crew are slated to launch toward the space station at 4:04 p.m. EST (2104GMT) on Nov. 12 on an 11-day mission. Three spacewalks areplanned to deliver a set of large spare parts for the outpost. The shuttle willalso return NASA astronaut Nicole Stott ? who arrived at the station Aug. 30 tojoin its six-person crew ? back to Earth. Atlantis?launch pad trek was initially scheduled for Tuesday. 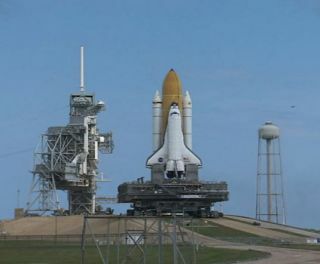 But delays caused by acrane, wiring and solid rocket booster cable glitches kept the shuttle fromrolling out until today. NASA isalso preparing for the planned Oct. 27 launch of its first Ares I rocketdemonstrator, the suborbital Ares I-X booster, at the Kennedy Space Center.That rocket is slated to roll out to the nearby Launch Pad 39B on Oct. 19. Still,engineers have about three days of padding in their work schedule for a potentialNov. 12 launch, Beutel said. If Atlantis does not launch in November, the nextopportunity could arise in December, he added.